…Map of blockades in Oaxaca since start of movement here There are still mobilisations in both the North and South of Mexico, plus a number of barricades in the state of Oaxaca, including ones which prevent access to the capital. 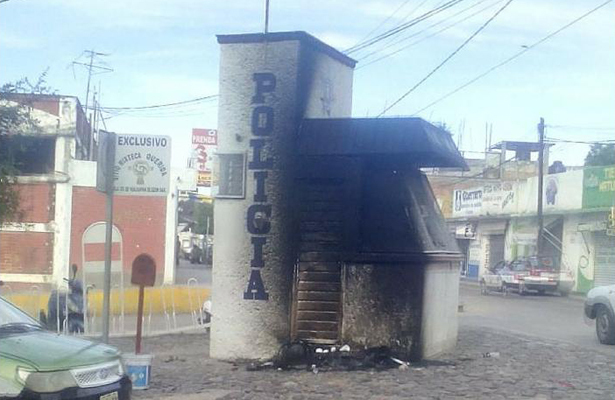 Mexico, Oaxaca State, Huajuapan de León: about 50 probable anarcho-punks avenge the death of their friend/comrade Salvador Olmos García by furiously ransacking the town Some fires in the street, 3 police “modules” burnt, an anarchist flag placed on the national hero Benito Juarez, the construction of which the murdered anarchist radio broadcaster had mobilised against along with other residents (see here for background to this murder). Apparently – according to this article – some CNTE teachers organising against the neoliberal education reform have started a dialogue with these “youths” to “restore calm”. Mexico, State of Oaxaca : further follow-up of the movement in spanish, with lots of pictures 15th day of mobilization. 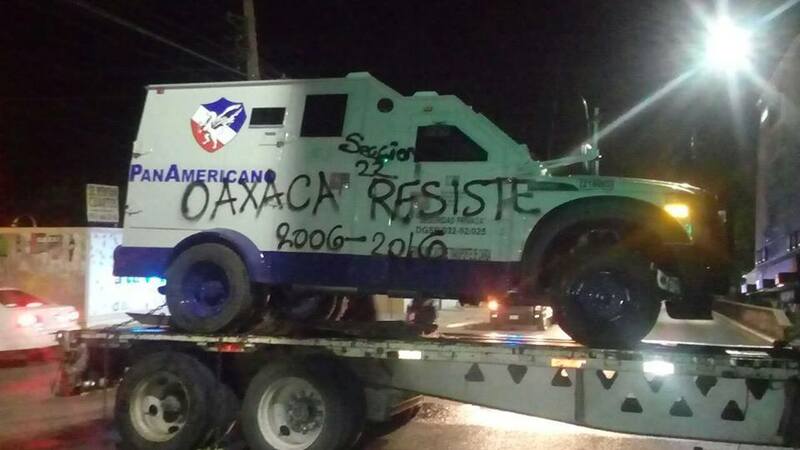 There are now 29 blockades in the State of Oaxaca, which is more than in the first days. Some cops were detained by participants during a march. Still lots of solidarity initiatives all around the country. …Montpellier: empty cinema 1 minute from Place de la Comedie (town’s equivalent of Trafalgar or Times Square) with 5 separate movie theaters and large flat, occupied for several weeks, throws public party after a call from the bailiffs and EDF cutting off its electricity Communiqué:“Revolt against misery: reappropriate space, your memory, your desires…Bring your musical instruments and instruments of revolt, your nutritional or etholic fuels, your overflowing laughing imagination, your fireworkish anger like a sparkling bouquet“. This mainstream crap makes out that the squatters are occupying a space which needs to be transformed into desperately needed accommodation. In fact, the 2-year project is to gut the interior and transform the space into luxury flats for the rich, costing about 200,000 euros for less than 40 square meters. The selling of these flats has already started in order to finance this transformation even though it’ll be at least 2 years before they actually exist. Lots of solidarity actions around the country, whether in indigenous communities or in the main towns and cities. In Nochixtlan, where the horrendous police murders took place a few days ago, a march was organized to the center of this very poor town (people in several neighborhoods have no light or electricity – near a highway connecting to State capitals). Participants called the CNTE “not to betray the movement” and for the resignation of Oaxaca’s governor. Seems that in Chiapas, where 5 roads blockades took place in the capital, a secret agreement was signed with the authorities to stop unrest (according to this article of the leftist daily La Jornada). We also heard with sadness the news of a community radio activist and member of the anarcho-punk movement was killed by police after mobilizing against a police raid on this radio. – here… 04/07 update : comrades of the recently murdered comrade, who are members of the Libertarian Block of Huajuapan, have published a communiqué in which they indicate that he was tortured by police, escaped from detention in one of the town’s police stations, and was then hit, probably voluntarily by police car. Police then left town. Yesterday many were those who ended up in the dungeons of the state. One hundred to be exact. One hundred detainees because of the union betrayal. We would have liked to write more to explain our action. Unfortunately, following this action, carried out in a place under surveillance, we were seriously injured. We managed to escape the cops thanks to the complicity of the crowd in the street who cheered us and covered our retreat. Insurrectionary solidarity with the 250 prisoners. Insurrectionary solidarity with Olga, Panagiotis, Christos and the comrades of the CCF who want to ecape. 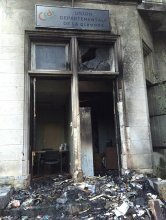 See here for a discussion in French concerning the different opinions amongst anti-authoritarians concerning this attack on the CGT HQ. 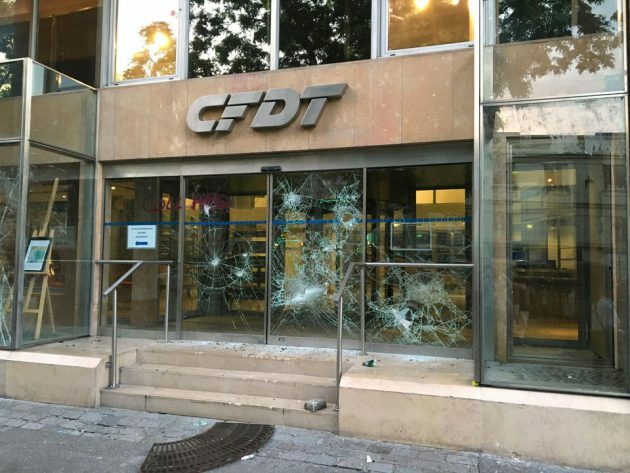 The attack on the CFDT occurred in response to the collaboration of the CGT and CFDT unions with the police to stop violence by anarchist comrades and other radical militants. 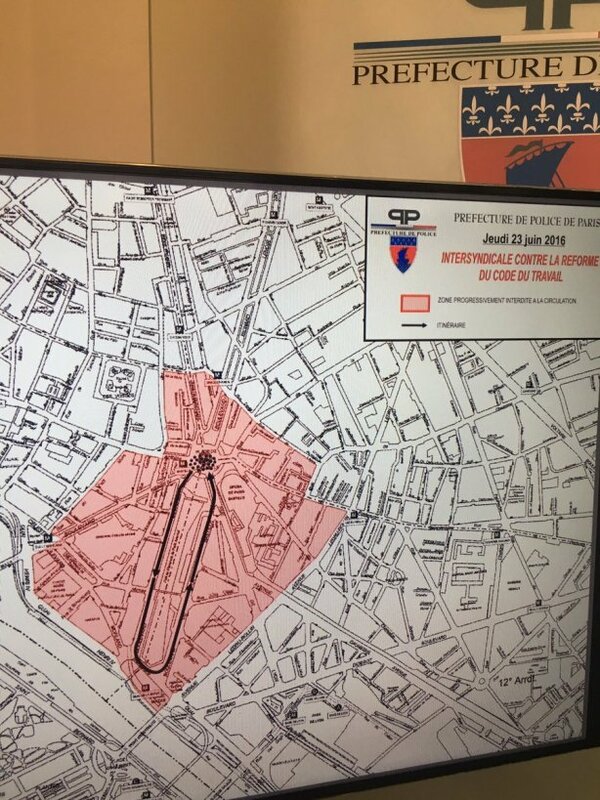 On 23/6/16 the unions collaborated fully with the police and comrades were pursued not just in the vicinity of the union demonstration but throughout the city. Throughout the day in Paris a true “man hunt” took place against radical militants. 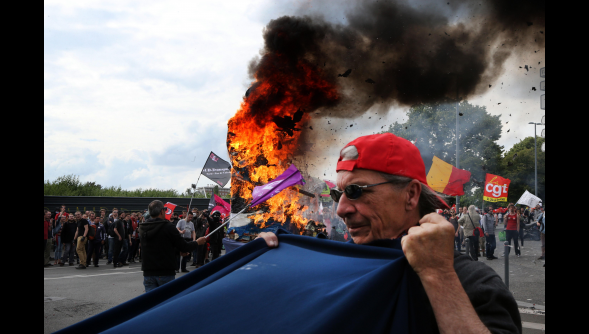 More than 100 comrades were arrested in Paris. 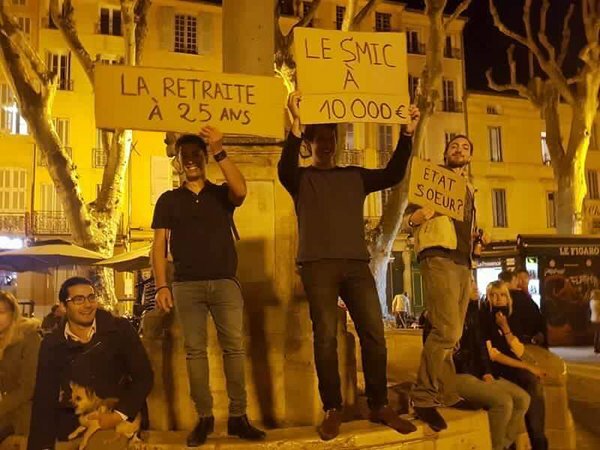 …Hauts-Pyrénées (Tarbes): 2 deputies (equivalent of MPs in UK) get their electricity cut off by CGT base activists The CGT trying to show how radical it is in order maintain some credibility and its union dues or genuine expression of anger by the CGT base? Probably a combination of the two: there are many people in the CGT who, on the one hand express some element of independence from the hierarchy, but on the other hand are essentially submissive to “their” organisation (for instance, by not criticising CGT stewards for their horrendous policing role on demos). The need for “the organsation” is the first expression of resignation and submission. Such a dependence is reinforced by an ideology of the collectivity which avoids seeing the difference between organising an organisation and organising specific activities. Proletarianised individuals believe that they are protected against the misery of this world by adherence to an organisation, when the contradictions of such organisations invariably undermine such protection (a bit like the traditional family). Acting director-general of Government Communication and Information Systems, Donald Liphoko said: “There can be no issue which cannot be resolved through democratic processes and dialogue. 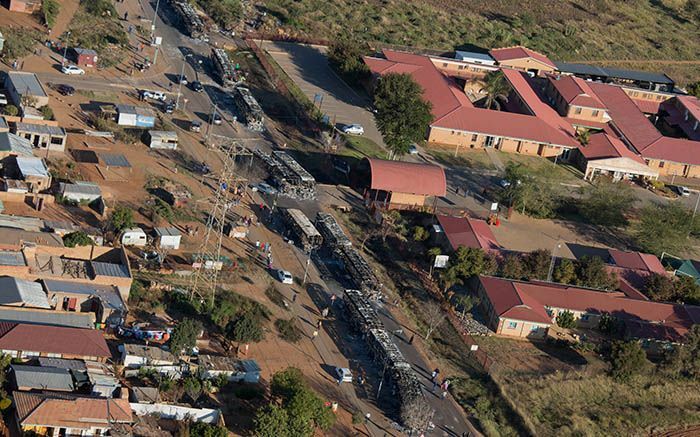 Members of the public are encouraged to use channels available to raise their concerns”. People in Pretoria beg to differ. Mexico (Oaxaca) : more about the movement Many initiatives of solidarity with the current movement in Oaxaca – the killings have left a significant mark on people, as happens regularly when such events occur in Mexico. 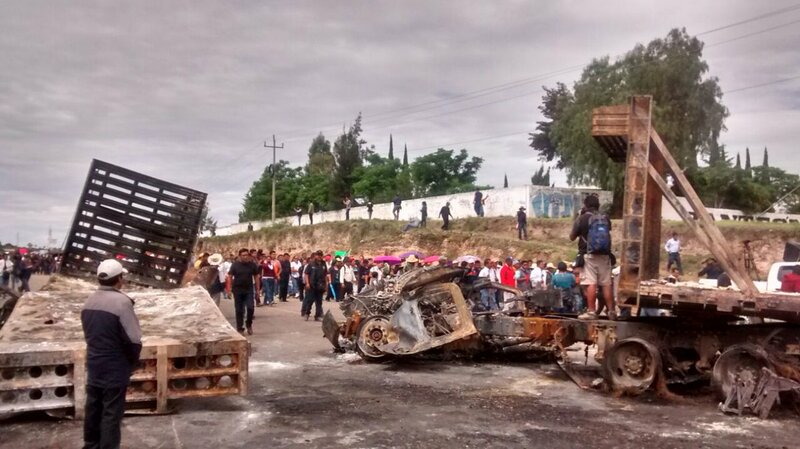 In Nochitxtlan the inhabitants are continuing their road blockades and barricades and have kicked out the city’s municipal president. The teachers’ Coordination is calling for lots of marches throughout the country, and has begun negotiations with the government, whilst, however, it must be said not wanting to backtrack on their take about the plans for the reform of Education. Critics of the Coordination are numerous, and rightly so. In the state of Veracruz, the inhabitants of Coatzacalcos have expelled the military from their city. 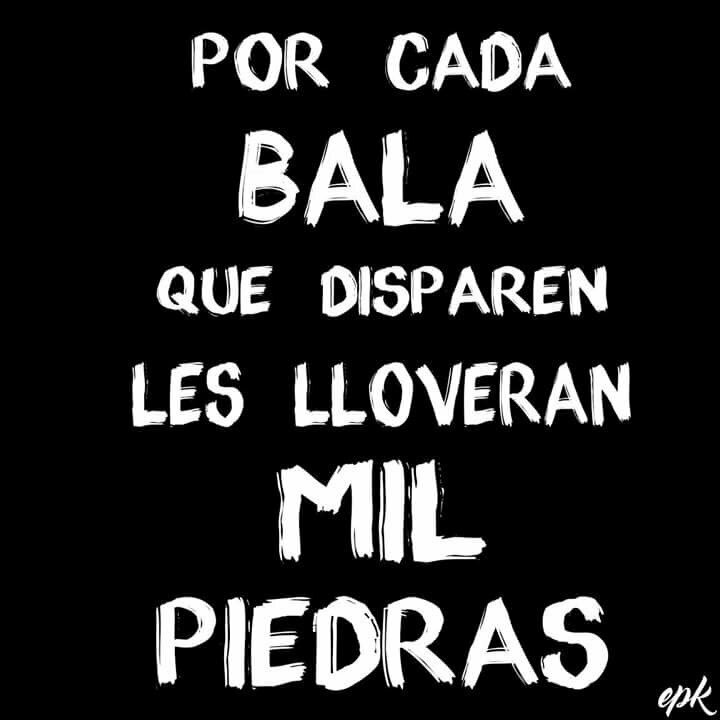 (Note : Pi). Mexico, State education offices smashed up in Guerrero (Chilpancingo); road to Acapulco favoured by tourists blocked by teachers; town hall of Tlapa taken over… Oaxaca: teachers cancel classes after cop killings … possibly as many as 12 killed…reports about 32 dissappearances (people missing or going unreported) Barricades and road blockades are maintained in many regions of the State of Oaxaca. Solidarity is strong in several parts of the country, with people organizing events to support the movement, sending food, medicine, etc. In Mexico City, students of the UAM Azcapotzaco are on strike. A university radio station’s offices are also occupied. 30 to 40 anti-authoritarians (the figures vary), having organised a gathering in front of the state delegation of Oaxaca in Mexico City, are arrested and imprisoned for a few hours, and then released, having had lots of support, as word passed around very quickly. The young women were sexually abused by the cops…. 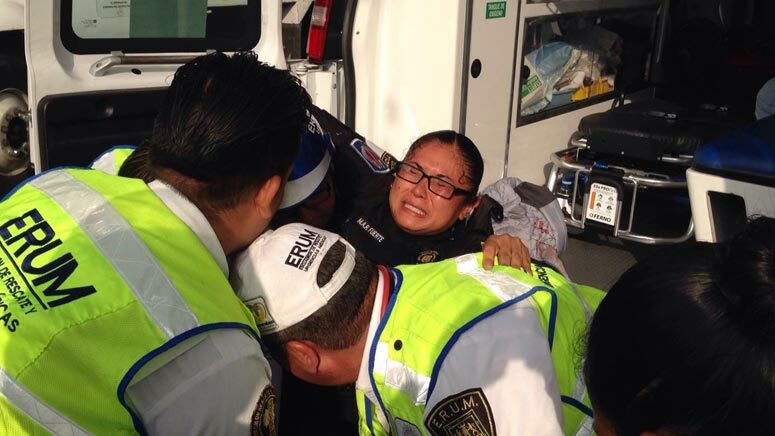 Oaxaca: police sent to Oaxaca by air (7 planes), as they advance slowly by road. They put an end to 2 road blockades in southern Oaxaca’s Tehuantepec isthmus… and then to a third one in Salina Cruz, which blocked all accesses to a PEMEX refinery (includes a video)…there are still 9 blockades in the Isthmus and at least 10 in other regions of the State…In Juchitán, the region’s main town, 7 shops were attacked by locals, and five vehicles stolen at Nissan…In Oaxaca’s capital, explosive devices against electricity company.….In State of Michoacán, a protest was held by miners of the Pacific coast harbour city of Lázaro Cárdenas in solidarity with the movement (see this ). UK, London: 9 cops injured trying to shut down rave party “Revellers responded by hurling bricks at police in riot gear and dog handlers in a five-hour stand-off that neighbours likened to “storm of people”. France, Between 125,000 and 1.3 million demonstrate throughout country, whilst in Paris there are heavy confrontations with cops Cops were exceptionally violent, it seems, including pushing people down off a wall into a confined space and firing flashballs directly at them from 3 or 4 meters away, yet the media (surprise surprise) talked about the horror of a few windows of a children’s hospital broken. In a world that is truly upside down, cracked windows are infinitely more word-worthy/screen-worthy than cracked skulls. 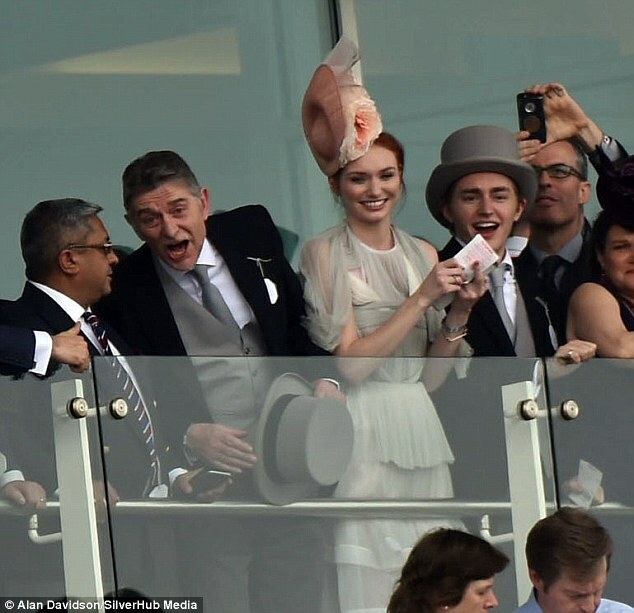 “…Breaking the windows of a hospital, even inadvertently, is idiotic; but jumping at the chance to exploit the plight of sick children and their parents to discredit a social movement is indecent and unacceptable. And yet it is the communication strategy implemented since yesterday by Messrs Cazeneuve [Minister of the Interior] and Valls. Gleefully taken up by the right and relayed on a golden tray by all the media. …This indecency is all the more shocking when one knows the situation of the public hospital today. Messrs Valls and Cazeneuve, “revolted” from the bottom of their hearts by five broken windows, are they revolted by the appalling working conditions of the hospital staff? When a clinical geneticist has to work 70 hours a week because the direction of the hospital cannot afford to employ a new doctor or even a secretary, what are the consequences for all these sweet little sick children whose bedsides our ministers came running to since yesterday? When the orderlies and nurses are exhausted, worn to the bone and paid the minimum, what about the quality of care and attention necessary for those who spend months or years in hospital corridors? 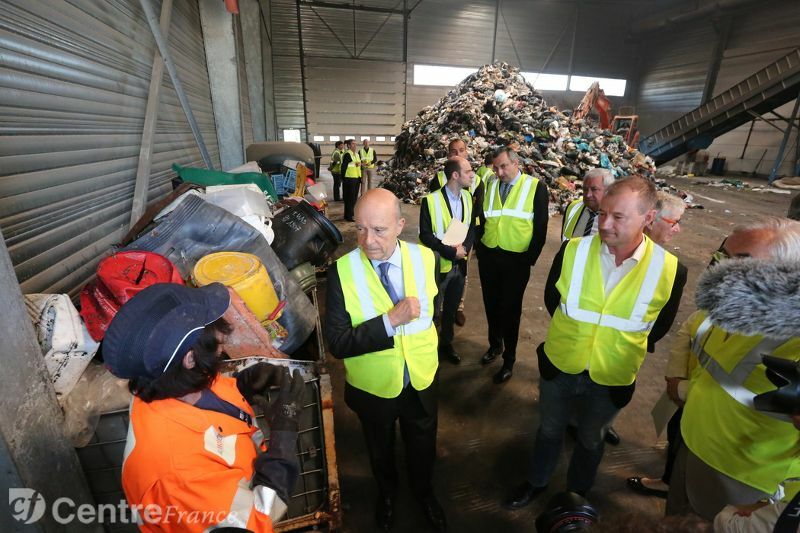 When they are on the same “emotional” plane of the plates of broken glass and hundreds of thousands of bereaved families, have Messrs Valls and Cazeneuve no shame? And all those journalists who headlined this horrific attack against the hospital for “sick children”, do they weigh the meaning of their words? The prize for infamy is obviously presented to Mr. Cazeneuve who still managed to add to the equation the son of two policemen killed the day before yesterday. Hundreds of thousands of people defy the government in the streets. One or two break the double glazing of a hospital. A shithead kills two policemen with knives. Their three year old son is in care at Necker hospital. Mr. Cazeneuve establishes an emotional relationship, emotional and psychical between these two sets of facts: the struggle against the Labour Law and the government, the shock of the brutality of the murders and the plight of this child. If the young rioters who broke the windows of Necker were idiots, MM. Valls and Cazeneuve themselves are obscene.” – A parent of a very sick child at the Necker hospital (translated from here). Video of CGT syndicalists attacking cops, with 20 cops injured. This is almost certainly after the cops had indiscriminately attacked CGT members who’d been utterly non-violent. The state also used water cannon laced with tear gas. Some sources say around 10,000 in the independant/autonomous part…several vehicles burnt Repression was hard, with very violent attacks from cops on the side of the combative part of the march…”street medics” say they treated several hundred injuries from defense bullets (replacing the flashball), gases, string grenades, blows and charges. Apparently this march was the biggest of this 3 month long ongoing movement…lots of people went to Paris, so events in the rest of France were more symbolic and limited in terms of participants. That’s in the context of a huge number of security measures for fear of a terrorist attack during Euro 2016, during the state of emergency and just after attack by Islamic State supporter that left 2 cops dead. 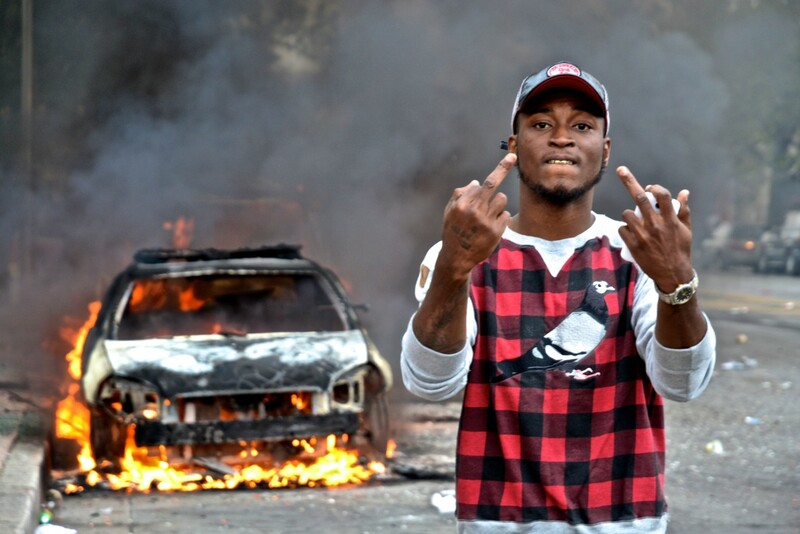 At least 29 cops were injured…and 58 arrested. 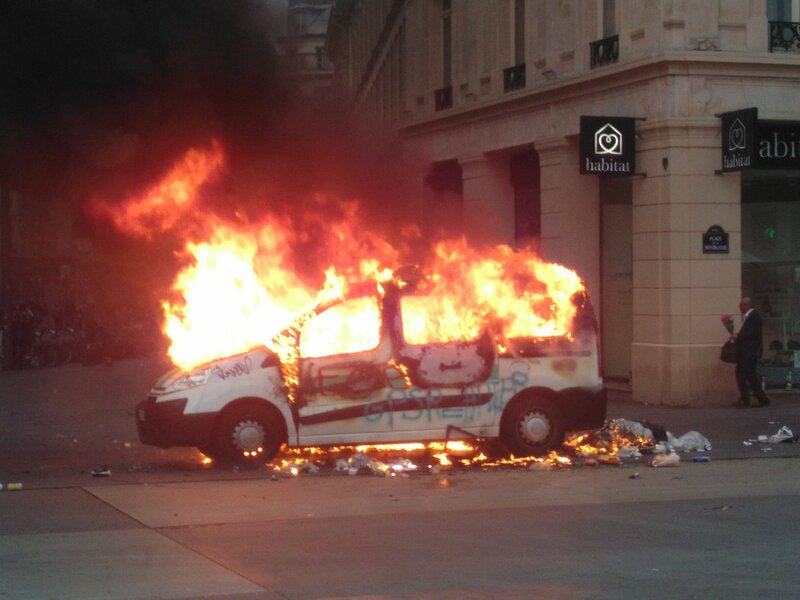 After main march, wild demo around 9pm instead of another “Nuit Debout” : very few cops (those who were in the way were attacked), some shops attacked, a vehicle burnt. 4 were arrested after intervention of the BAC cops. A few pictures and a personal report in french here. 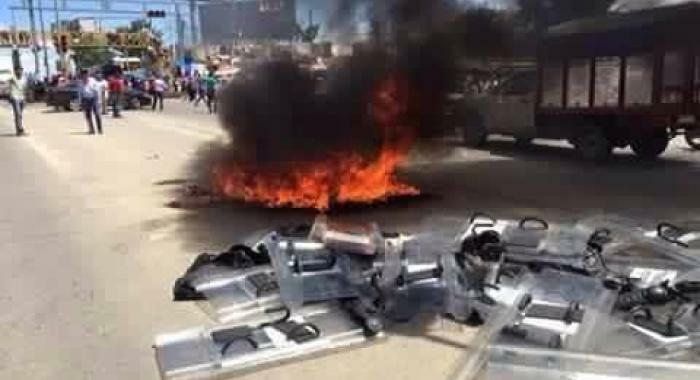 Venezuela: report claiming more than 10 lootings now occur every day “Slum-dwellers and armed gangs wait for nightfall to hijack food trucks or ransack stores.. Food riots and violent looting have become a daily occurrence across scarcity-struck Venezuela and a major problem for the struggling leftist government of President Nicolas Maduro. Despite hours in lines, Venezuelans increasingly find that coveted supplies of subsidized flour and rice run out before they can buy them. Many are skipping meals, getting by on mangoes stripped from trees – or taking matters into their own hands… More than a quarter of the 641 protests last month were for food, according to a tally by the Venezuelan Observatory of Social Conflict, a figure that has risen every month this year. Venezuela’s angry streets are arguably a bigger threat for Maduro than the political opposition, which is pushing to remove him via a recall referendum this year. 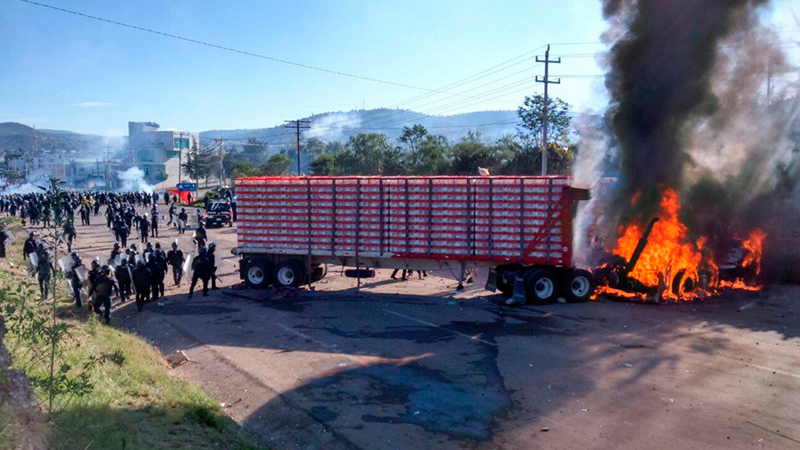 One recent food protest came within blocks of the Miraflores presidential palace… For months now, groups have ransacked delivery trucks that crash or suffer flat tires. 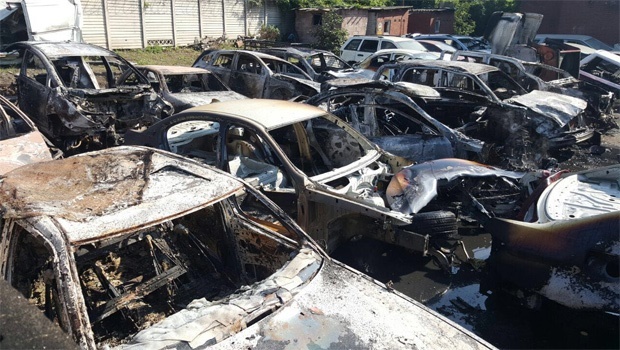 But in recent weeks, there has been an increase in frustrated shoppers storming supermarkets after food runs out as well as cases of communities or armed gangs organizing lootings, sometimes reportedly to re-sell the goods. 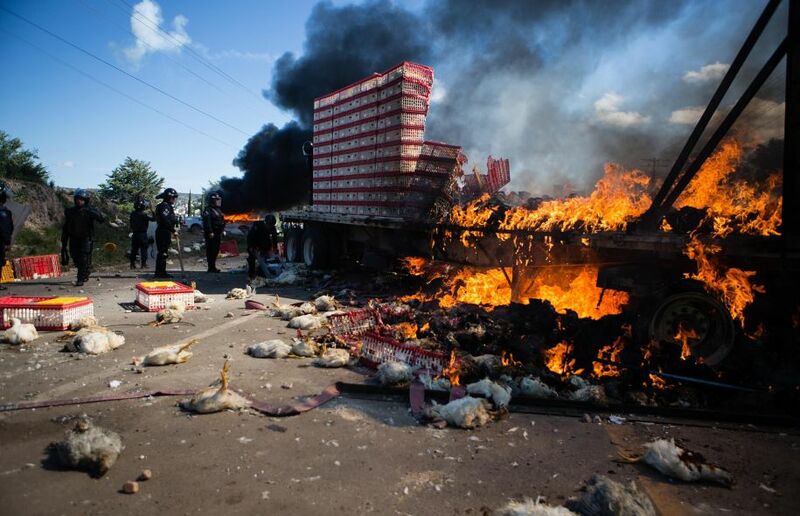 In the small roadside town of Tacuato in the remote Paraguana peninsula late last month, residents and delinquents frustrated after spending the night in line for no food decided to loot the next passing truck [a situation that echoes what happened after the 1991 insurrection in Iraq when residents declared they would expropriate 1 in every 3 passing trucks — SK]…Amid the tensions, Venezuelans are increasingly drawing parallels with the 1989 ‘Caracazo’ – roughly translated as ‘Caracas disaster’ – when hundreds died in riots and looting sparked by a fuel price increase amid an economic crisis.” Numerous people have recently been killed in local riots already. Algeria (Tizi-Ouzou, Kabylia) : hundreds organize picnic in square during month of Ramadan to protest against “climate of terror against those who don’t fast” (in french). “We have to put a stop to this : they can’t force everybody to go to heaven”. Some political rackets wanting autonomy of Kabylia or the independance of this region (traditionally less religious than the arab provinces of Algeria) were present. 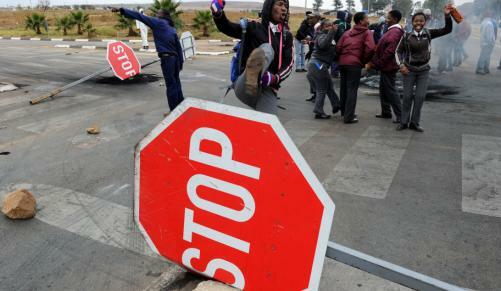 …Eastern Cape: province-wide taxi-strike causes temporary cancellation of exams and other disruptions… Kwa-Zulu Natal: operations at Isithebe Industrial Estate grind to a halt as disgruntled residents cut off water supply ‘The estate employs more than 20‚000 people and is “the main economic lifeblood of the Mandeni area”’ . 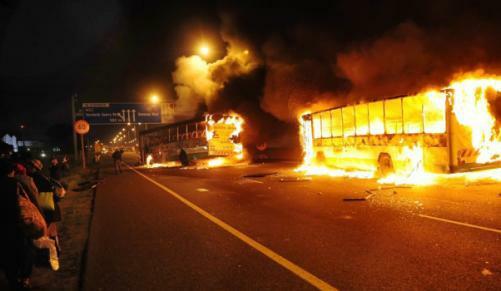 This follows widespread rioting that saw the destruction of several factories in April. 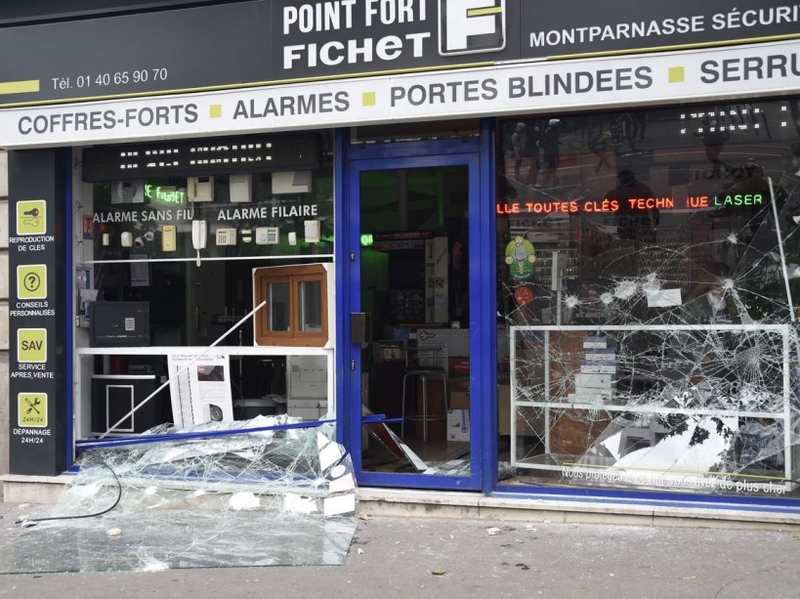 France, Paris: heavily armed state “vigipirate” military “security” attacked and insulted by about 20 youths …right wing homophobes attacked by anti-fascists. Without knowing much about precise details of this homphobe group, I find this a bit silly. It’s quite easy to annoy these idiots by taking the piss out of them; physically attacking them outside of a situation where they are obviously encouranging physical attacks on gay people seems crudely militant [SF]… Ales: 4am blockade of tramway – confrontations with cops and firemen These things are happening all the time, in different parts of the country, involving few in number but often effective – ie preventing the circulation of trams etc. for a few hours. 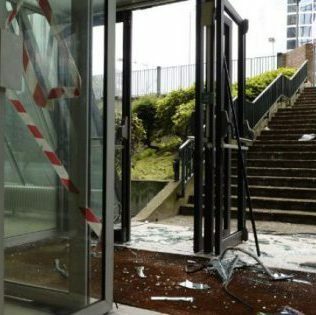 France, Nantes: town hall windows smashed, walls tagged, etc. Certainly this would not be the first time that faction-fighting was the motivation for protests. Like an ingrown toenail, the decomposition of the ruling party has seen the generalised violence perpetrated against proletarians increasingly turning inwards against this or that faction of the ANC. Political assassinations, routinely deployed since the turf-wars between UDF, AZAPO, ANC and IFP in the 1980s, and generalised in Kwa-Zulu Natal in the 1990s during the ‘strategy of tension’, have been a constant tool in the arsenal of the political class. 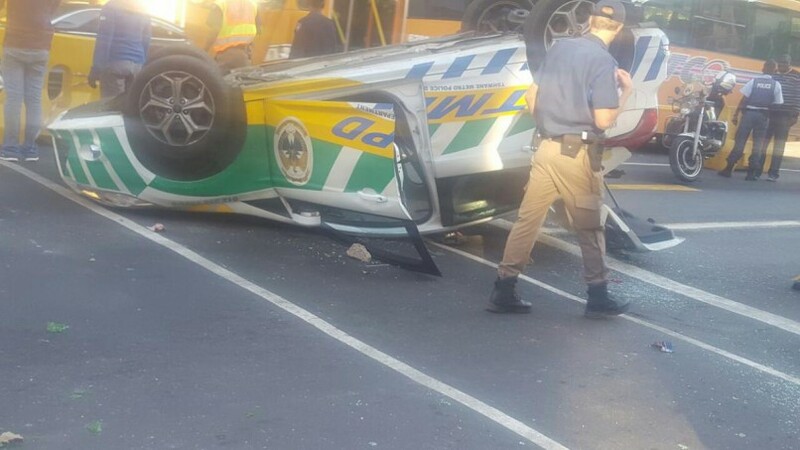 In the first 9 days of this month alone, at least 4 ANC officials were gunned down by hit-men, presumably by rivals in their own party. It is by no means inconceivable that political riots could be increasingly resorted to, for the same purposes. Unlike assassinations or terrorism, however, such riots seem far more two-edged a weapon, as the danger of them getting out of hand and developing into an actual assault on bourgeois law and property always hovers in the background. Until now, the most radical class-consciousness in the country has expressed itself in through apolitical means: mass election abstention and independent mass organisations such as the Durban-based shack-dwellers movement Abahlali baseMjondolo that even go so far as to criticise the legitimacy of the state as a form of representation for the poor. But, just as present riots begin with disgust for all politicians and end with support for the lesser evil of supposedly less disgusting politicians, so AbM began with election boycotts and ended up, in the previous elections, supporting the supposed lesser-evil of official opposition party. As for your point about lesser or worse evil: the real point is that the movements we’re most interested in combat in practice things that the worse or better evil wouldn’t tolerate if they were in power. Yet when such movements resort to political demands for the better or worse evil to replace the current lot it both undermines ideologically what in practice is being done (ie something self-organised) by asking for something that is not self-organised, and is just a political reflex to come up with an apparently “realistic” demand that hierarchical power can understand and possibly meet, especially if it buys them time. However, in certain circumstance, demanding a reform is quite clearly and genuinely the better evil insofar as these miserable circumstances need to be resolved practically and usually pretty immediately (eg demanding electricity or water or a wage rise or whatever are obviously concrete demands which if met would ameliorate the situation). Everyone does this almost everyday if they have no other means of getting what they need (eg they can’t connect the electricity or get water themselves, or they can’t get non-nuclear-powered forms of electricity or they can’t abolish money for the moment, etc. etc.). I don’t think it helps though to say that demanding some political party in opposition is “the worse evil” – the “evils” are essentially the same, neither worse, nor better. Usually when people demand these false choices without even acting independently it’s indicative of how they are avoiding acting independently and how they want to continue avoiding acting independently. Which is not the case with, for example, Abahlali baseMjondolo; I’d guess – though without knowing enough about them – that after years of acting for themselves with all the constant miseries (including some murders committed by the state, if I remember correctly) they felt the need to present themselves “realistically” out of the exhaustion of not seeming to make progress (this is pure hypothesis on my part). If instead they’d made connections with other social movements that had had independent aspects and had theorised this into a critique of external authority more generally, maybe the result would have been different, but almost invariably – and this is a major problem – movements stay within their “comfort zone” because launching into the unknown seems far too dangerous. Much of this “unknown” is not that unknown historically – because history is full of examples that modern movements have yet to try out, mainly because they remain unknown to them, and one of the contributions those of us who want a revolution can make is to try to talk about these historical examples, whilst somehow connecting them to the present…Well all that sounds a bit platitudinous as well, but sometimes banalities have to be repeated. Paris: various letters reporting on movement The following was altered on 13/6/16 following a highly critical email from a friend in Paris. But I received this email from a friend: “Decidedly, with the Wises, via Jack, we are in highly embroidered fantasy politics! The various attempts to launch a “Banlieues Debout” ” were even more lamentable than “Paris Debout”. It was so grotesque that even the organizers of the “Place de la Republique Debout” preferred not to talk about it. 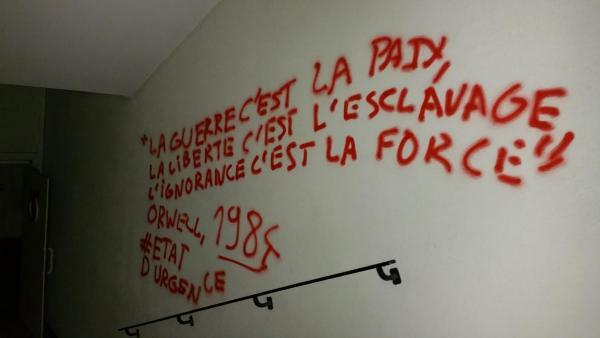 The few “Banlieues Debout” were launched by micro-cartels of organizations close to Mélenchon [Leftist former minister], such as the NPA [semi-Trot New Anti-capitalist Party], the Marxist-Leninist sects, sometimes with the participation of the PCF [French Communist Party]! 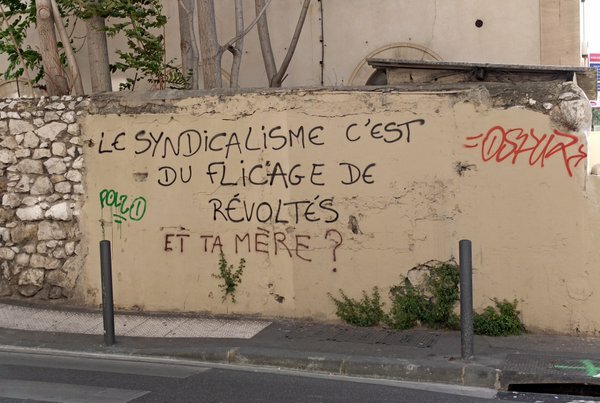 Plus a handful of anarcho-leftists, AL [Alternative Libertaire – Libertarian Alternative]-types and “free” electrons around Lundi Matin [Tiquunistes] trying to get closer to the “masses” of the suburbs, especially the young masses originating from the Maghreb. To give you some insight into the extent of their opportunism, the neo-AL-type leftists even wanted to ban pork in the canteens they intended to hold in the suburbs, so as not to alienate Muslims! In Montreuil, it’s obviously the Gatti [well-paid artist-recuperator with a”libertarian” image] gang which tried to organize his “Montreuil Debout” coming along to defend his crap and calling on people to support Gatti getting state subsidies to maintain his politico-cultural boutique…” Nevertheless, the link has some good photos. Mexico (Chiapas) : 250,000 in march by Education workers and supporters in population against Education reform and army presence in Chiapas A few days prior to this march, 65 town halls were occupied in Chiapas as well as 22 in Michoacán (including in main cities and towns) to ask for talks between the CNTE (Education Workers National Coordination), in a reformist logic. Access to the town hall was also blocked in State of Guerrero’s capital, Chilpancingo, as well as a highway. 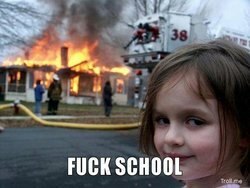 This article says 60% of the State of Tabasco’s schools were on strike during the week. State of Veracruz : Mexico’s main party (the PRI) premises burnt before elections State of Veracruz’ governor, Duarte de Ochoa, belongs to the PRI. He is accused of maintaining relationships with organized crime, and of having covered up large amount of dissappearances, executions and femicides in Veracruz since he was elected. 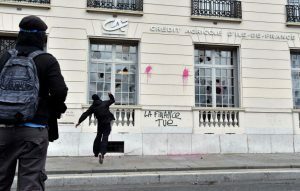 France, Paris: anti-fascist demonstrators, on 3rd anniversary of death of anti-fascist at hands of skinheads, smash gentrifying luxury shop windows, estate agents etc.…restaurant “occupied” during lunch hour for an hour, with banner hung out 1st floor window “Against the Labour Law and its world” As someone else has pointed out, this now widely-used slogan really doesn’t extend any significant critique to “its world” beyond sometimes talking about neoliberalism as if it’s the only form of capitalism that exists or has existed. In this case, a critique of restaurants as such (see this excellent critique) is reduced to a critique of multinational fast food restaurants, which even fairly mainstream ideology criticises. India, Mathura: 24 killed, including 2 pigs, during attempted eviction of 3000 squatters “…the principal home secretary in Uttar Pradesh, told Reuters police had initially responded to gunshots with teargas and rubber bullets but returned fire when the two police officers, including a superintendent, were killed. 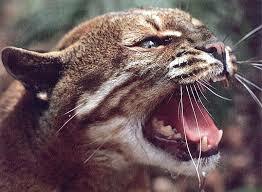 Other officials said it was not immediately clear how the squatters were killed. 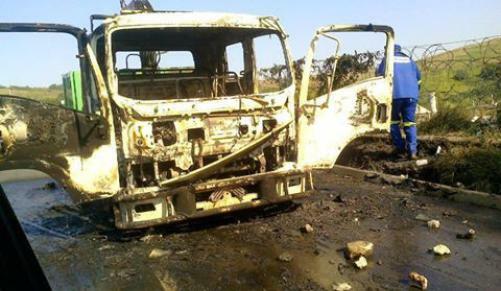 Media reported that at least 11 died in a blaze during the clashes. Officials believe the squatters belong to a sect which media described as a self-styled revolutionary group with a bizarre list of demands including the axing of the position of prime minister, replacement of the Indian currency and cheap fuel. The group emerged from among followers of a powerful religious figure who died four years ago, according to reports. Uttar Pradesh police chief Javeed Ahmed told reporters at the scene the group had set fire to their tents before abandoning the camp after the clashes.”Subsequent searches by the police revealed that the activists of the group … had stored firearms and other weapons, including grenades,” he said.”… In addition to the two dead policemen, 23 police personnel were hospitalized with injuries. The police recovered 47 guns, 6 rifles and 179 hand grenades from the camp. 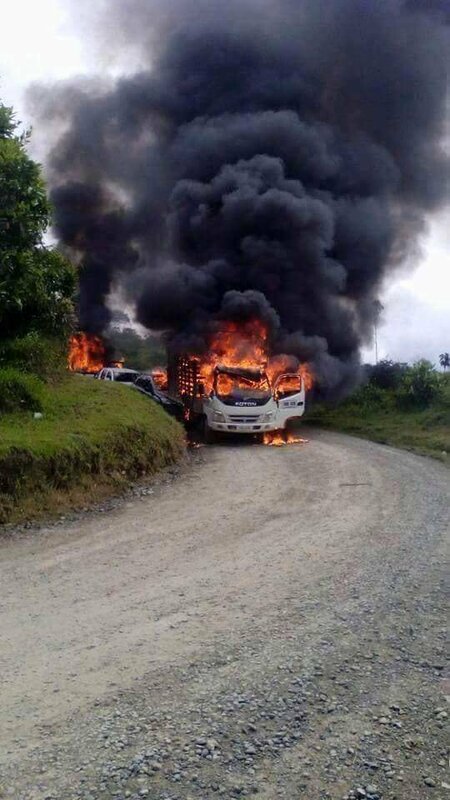 Colombia: 2 killed by riot pigs on 4th day of agricultural workers’ demos and strikes demanding improved conditions; over 30,000 agricultural workers involved in different parts of country… farmers march and block roads in 45 municipalities of 24 departments (out of 32)… 2 killed by bullets in department of Cauca, known for its indigenous farmers movement. Farmers (mainly indigenous) protest against the lack of cultivable land, misery, and an increase of import prices for various products (in the framework of Free trade treaty signed with Europe and the US). For a critique of “education” in English see this; for 2 in French see this and this.